The benefits of massage have been well-documented on this site, and they range from better sleep and circulation to pain relief. When we decided to start our home spa project we didn’t want to dive right into buying a premium massage chair, so we started with a massage cushion and never regretted it. It gave us most of the benefit of a bulky massage chair but at a fraction of the cost and space. We can literally just pick it up and move it to a different chair – the office, the conservatory, the kitchen – wherever we want to give ourselves a 15-minute treat. Strap it to the chair, plug it in, press play! Easy. The massage is strong enough for me, though Jane thinks it’s too strong and puts a thin blanket over it. We paid extra to get one with a neck massage, and were very glad we did – that is a real bit of luxury. All in all, we heartily recommend getting one of these cushions, so we’ve made a list of the best ones we saw while we were researching our decision. Some have shiatsu mode, some have heat, some are smaller, and some can be used in the car. We hope this guide helps you find the one that best fits your needs. In a hurry? This table compares the top 3 options. Scroll down for in-depth analysis of all the options. This massager comes in a sleek and stylish matte black. It’s big enough to cover a seat at 6 x 11 x 17 inches, but is surprisingly slim and only weighs 2.8 pounds. The DR8573 has 5 motors positioned throughout the cushion for optimal coverage. 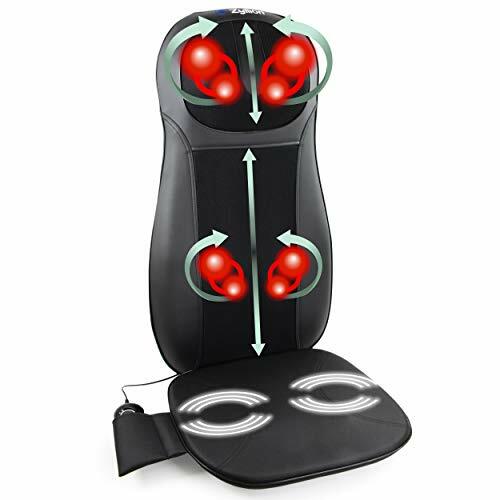 It also has 3 different massage intensities for you to choose from. Dr. Scholl’s massage seat comes with a handset for activating heat. Note that the heated area is only 6 x 5 inches in size, so you won’t get heating for the entire cushion. Some caution is needed when using the heat, as it goes up very slowly but surely, and may end up being too hot. If this worries you, you can cover the heated area with a blanket ahead of time. The massage you’ll get from this feels more like a soothing vibration all over. Don’t expect a therapeutic shiatsu massage from this cushion—you’ll need to look elsewhere for that. It does give you excellent value for its low price, with its relaxing vibration and quiet motors. This model also comes with an AC and an auto adapter, so you can use it in your car if you wish. 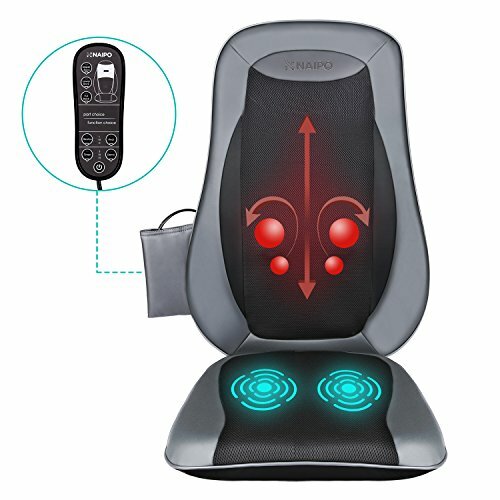 You should consider the Prospera massage cushion if you just want a massage in a small, concentrated area, or would like something to make those long car drives more tolerable. It comes in just one color: light coffee. It’s designed to be lightweight and thin at 1- x 3 x 6 inches in proportion and 3 pounds in weight. It’s well-made in quality, and quite durable, and very inexpensive. It comes with a built-in stripe for easy installation in a car seat so you can use it during your ride. You can plug it into the car cigarette lighter and it also comes with a transformer. One small quality of life touch is that the power switch is on the cord itself and is easy to reach during the massage. This beats out a lot of its competitors which have the switch on the pillow itself so that you have to remove it from position to access the switch. If you enjoy shiatsu massage, then you should check out the MSI-CS775H. It’s pretty large at 24.6 x 6.5 x 18.9 inches and comes in a very dark gray, with lighter gray piping. What’s interesting about the Sharper Image MSI-CS775H is that it touts not just a shiatsu massage, but an air massage as well. It has an air cushion that applies an air massage that lightly compresses your sides and lower back – just like a full-sized massage chair. At the same time, 2 shiatsu massage nodes move vertically along your spine to apply a deep-kneading massage. It comes with an option for heat—however, the heat is rather weak and barely noticeable. The air massage intensity has 3 settings you can choose from, as well as 3 back areas on which the massage will be applied. Something to keep in mind, though, is that it does not come with a car adapter, unlike many of its listed competitors (I assume it’s too powerful for to be run via the cigarette lighter). The HoMedics MCS-750H makes it to our best of the best list for good reason. The cushion is covered with soft polyester, is made in the USA with quality workmanship, and will last you a long time. It measures 26.4 x 6.7 x 19.9 inches and weighs 13.9 pounds. Interestingly, its width is adjustable. It also has an integrated strap system that lets it easily install onto most chairs. Also of note is that it isn’t black—it’s a subdued mix of brown and tan. The MCS has 4 independent nodes to apply your massage. It comes with 3 massage styles you can choose from: Spot for a massage focused on one zone, Rolling for a light massage, and Kneading for an intense massage. As stated in its name, the Total Back and Shoulder massage cushion is designed to fully cover your back and shoulders for maximum massage area coverage (and as mentioned earlier, the width is adjustable). It offers a heating option with its massage. However, the heat isn’t very strong and its presence is hardly noticeable. Update – they’ve fixed the heat in the latest model. Whoo! 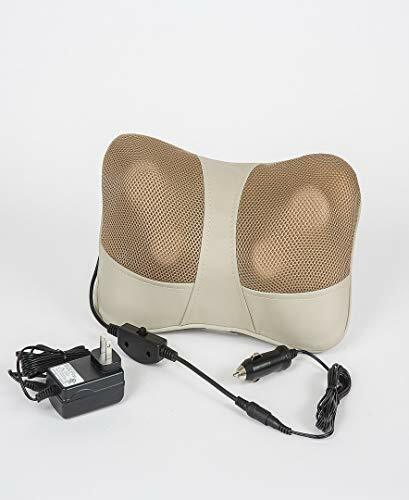 This massage cushion comes with a detachable cover so you can lower or raise the massage intensity with its buffer as you please. Even then, the Kneading massage is quite strong, and the detachable cover may not be enough. You may wish to layer some blankets between yourself and the cushion to tone it down. 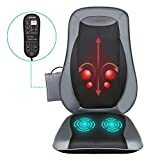 It comes with a remote control that you can program but note that this massage cushion does not come with a car adapter. Another thing to note is that the Homedics is pretty bulky, about 5 inches in thickness. Be prepared with a chair that can fit its bulk. 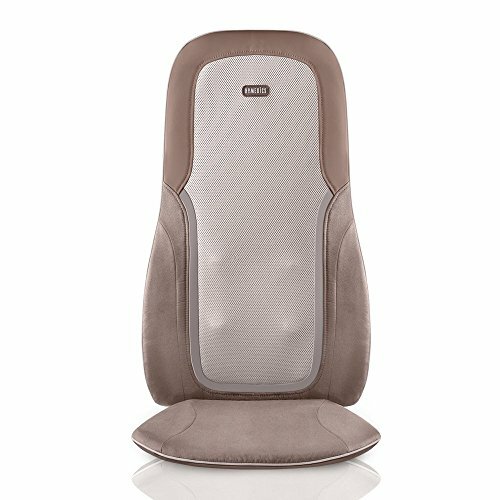 The Naipo Back Massage Seat Cushion is a Shiatsu massager. This means you can expect kneading, rolling, and also vibration massages. This type of massage is very relaxing as well as helpful in easing out painful kinks, aches, and tension in the body. There are three levels of vibration so that you can adjust it to your preference. Some users find that the highest setting much too hard for their liking so lower levels are preferred for just the right deep kneading massage pressure. The 4 powerful 3D massage nodes mimic the hands of a real massage therapist and are able to target 3 areas on your back – upper back, lower back, and full back area. This is very useful if you want a full-on massage or want to target specific painful areas in your body. If you activate the heating feature, you can alleviate some of your body pain this way. The Naipo is overall a great massage seat cushion you can use for your car seat or for a home chair. The only down side that we found is some people find the heating component inadequate. The Zyllion ZMA-13-BK is another small but mighty device. This handy little cushion comes in 2 colors: black and beige. It’s built to be compact and quite slim, thinner than the Prospera by half an inch or so. It measures 13 x 2.4 x 9.5 inches and weighs 3.5 pounds. Like the Prospera, it’s also well-made and sturdy. It comes with an adjustable strap so you can secure it to your chair and comes with a car charger. This massage cushion delivers a shiatsu massage with 4 massager nodes that rotate in opposite directions to apply a deep therapeutic massage. It’s quite powerful and gives quite an intense massage. In fact, you may want to take care when choosing the highest intensity if your muscles are already in pain. You may also want to add extra layers such as a pillow in between your spine and the massage cushion if the massage feels too strong. The motors are pretty quiet despite being so powerful, so you can easily drift off to sleep if you wish. A very nice bonus is that it also applies heat (which the Prospera does not offer). The design allows it to be usable on the upper and lower back, abdomen, neck, and legs. Its small size and discreet design make it usable even in an office chair. You can get your stress massaged away even as you get stressed at work! The Zyllion has some good safety measures built in. It comes with an overheat protection device, as well as a 20-minute auto shut-off function. This basically means your massage will last 20 minutes each time. You can start it up again to extend it if you wish. Something to note is that this massage pillow is FDA registered, so you can rest assured that Zyllion’s manufacturing and testing was fully approved by the FDA. 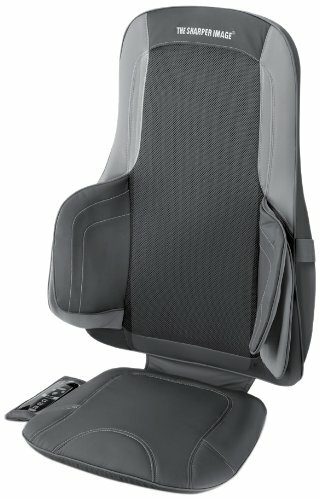 The Belmint seat massager is a very solid full seat massage cushion at a very affordable price. Giving you a delicious Shiatsu massage, you can experience kneading, vibrating, and rolling massage therapy in your pressure and meridian points. If you suffer from aches and pains especially in your back and shoulder areas, you should definitely consider the Belmint. Its ten vibrating points, coupled with the Shiatsu massage, penetrate your back to release tension, knots, tightness and stress in your problem areas. If you combine it with heat therapy, it will definitely help ease your aches for the day. 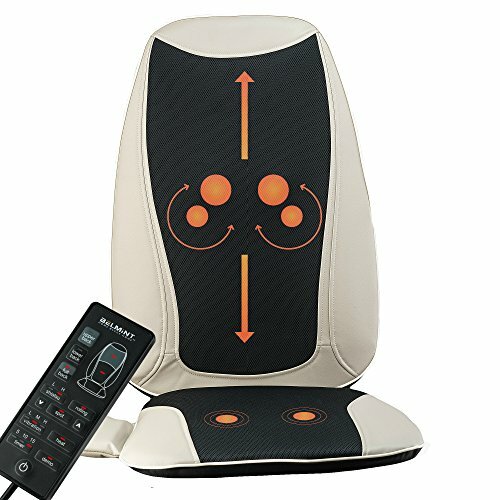 Similar to full-sized massage chairs, you can also actually customize the massage area on this massage cushion. You can choose to have a full back massage or just pinpoint specific areas like your lower back. The massage nodes can be moved to areas where you need targeted massaging — a godsend if you’re hurting somewhere in particular. Overall, it’s a great buy for both the sedentary desk worker or the active person who performs strenuous activities. 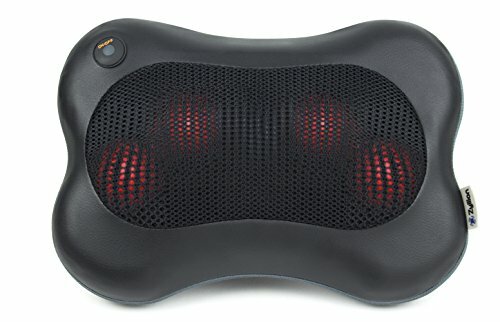 This massage cushion is very versatile too as you can place it on your computer chair, a living room chair, or even in your car seat. It comes with an AC and a car adapter so you can use it even when driving. Finally, we revisit Zyllion—this time for the ZMA-13-BK’s big brother. The Zyllion ZMA-14-BK is our pick for the best massage cushion on the market right now. This is the one we ended up buying ourselves and we’re very happy with it. You’ll probably be really shocked to hear this, but it comes in black. It measures 30 x 16.5 x 7.9 inches and weighs 15.5 pounds. It has 4 shiatsu massage nodes that apply rolling and deep-kneading massages to the back area. You can customize the nodes’ height, width, positions, and the zones it focuses on. The neck area shiatsu massage nodes are also adjustable and have an independent heating function. The shiatsu massage does not come with a setting for changing the intensity but you can easily lower the intensity by just covering it with a blanket before using it. You may end up needing to do so as the massage is very powerful indeed (as shiatsu is intended to be). 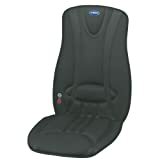 The seat cushion gives you 3 intensities of vibration massage to choose from. It shuts off automatically after 15 minutes for safety reasons. Note that this massage cushion does not come with a car adaptor. Similar to its smaller brother ZMA-13-BK, this massage cushion is also FDA-listed. All parts of testing and manufacturing for this product were approved and backed by the FDA guidelines.